DOVER, NEW JERSEY, August 29, 2018 -Today, Casio America, Inc. announced that it will release a new addition to the PRO TREK series of wrist devices for outdoor enthusiasts – the WSD-F30. Casio’s new WSD-F30 enables use of offline maps and GPS log recording for up to three consecutive days. In 2016, CASIO marked its entry into the smartwatch market with the release of the WSD-F10 wrist device for outdoor enthusiasts, with water resistance up to 50 meters and environmental durability built to military specifications. 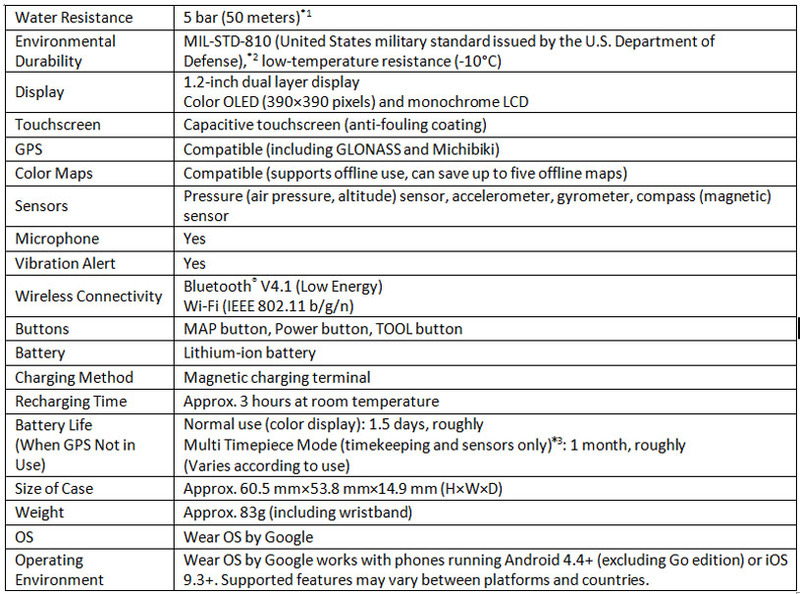 The WSD-F10 was built to run Google’s Android Wear (now Wear OS by Google) and the device and OS have been evolving together. 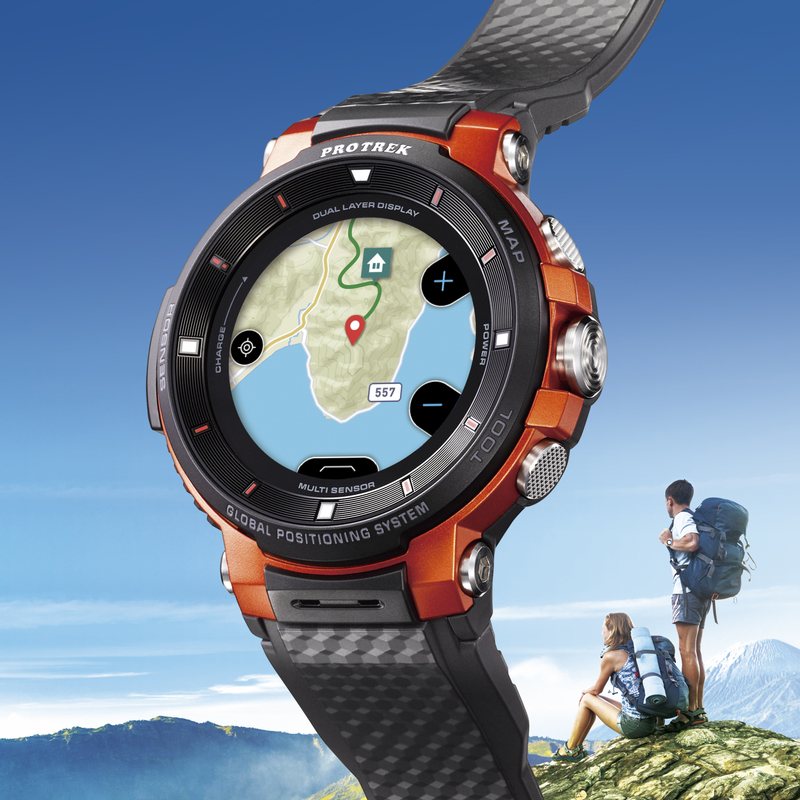 The following year, CASIO released the PRO TREK Smart WSD-F20 with GPS, which is winning over outdoor enthusiasts and other users with its wearable map functionality. The new WSD-F30 comes with Extend Mode which enables use of offline color maps and GPS for up to three consecutive days on just a single charge. In Extend Mode, time and measurement data is continuously shown on the monochrome display, and a color map can be displayed with a push of button. Extend Mode also conserves energy by switching the operating system to energy-saving stand-by mode on a schedule set by the user. It also ensures optimal power management based on the activity plan, allowing the user to track his or her current location on an offline map and record tracks during activities longer than a single day. Casio’s WSD-F30 features an enhanced dual-layer monochrome and color display which employs an organic EL display that shows maps and data in finer detail. The layout of the monochrome display now shows more than just the time; it also displays atmospheric pressure/altitude and compass bearing, as befits the PRO TREK outdoor gear brand. The wrist device also comes with Multi Timepiece Mode, an evolution of the popular Timepiece Mode that allows only time data to be shown in monochrome while toggling off smartphone communication and the color display. In addition to the time, Multi Timepiece Mode now shows measurement data such as altitude and atmospheric pressure in monochrome, while still extending battery life without a charge to about a month, like its predecessor. This feature provides useful information for outdoor activities at a glance while conserving energy. The inner components have been rearranged to create a watch case that is 3.9 mm narrower and 0.4 mm thinner than before, for a more compact profile that also looks good on trim wrists. Nano treatment gives the resin bezel a metal-like luster for a luxurious feel. The watchband has been improved and is now more flexible and has more holes for greater adjustability and fit. Shock: Tested to meet MIL-STD-810G Method 516.7 Procedure IV. • Vibration: Tested to meet MIL-STD-810G Method 514.7 Procedure I. • Humidity: Tested to meet MIL-STD-810G Method 507.6 Procedure II. • Low pressure transport: Tested to meet MIL-STD-810G Method 500.6 Procedure I. • Low pressure operation: Tested to meet MIL-STD-810G Method 500.6 Procedure II. • High temperature transport: Tested to meet MIL-STD-810G Method 501.6 Procedure I. • Low temperature transport: Tested to meet MIL-STD-810G Method 502.6 Procedure I. • Temperature shock: Tested to meet MIL-STD-810G Method 503.6 Procedure I-C. • Ice accretion: Tested to meet MIL-STD-810G Method 521.4 Procedure I.